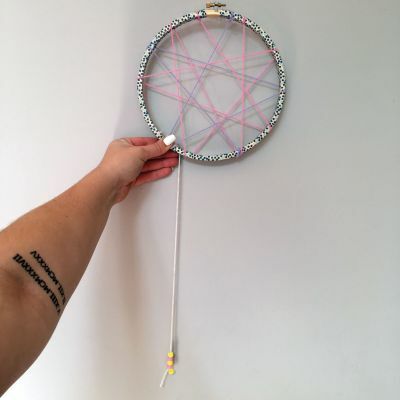 In our household, Dream Catchers are a must! 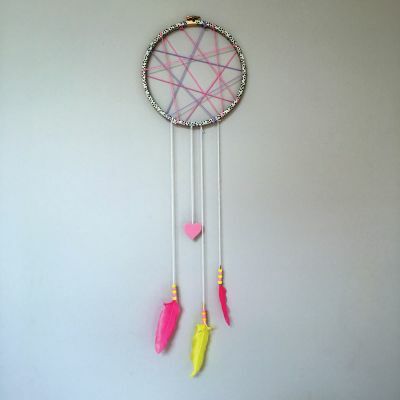 We have one in multiple rooms to stop those bad dreams and allow the good ones to come through. 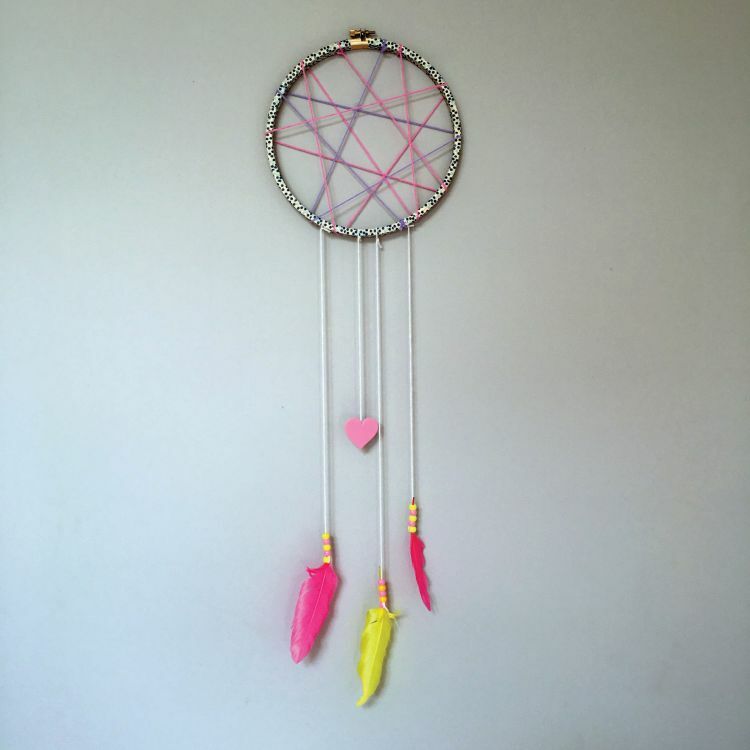 There is such a rewarding feeling of making these with your child when they understand that the point of hanging them above their bed is to bring in the good dreams. It makes bedtime a little easier, too! With so many different colour schemes to choose from, there’s something for everyone! Wooden or metal embroidery hoop, washi tape, 2-3 colours of yarn, beads, feathers, glue, paint brush, scissors. 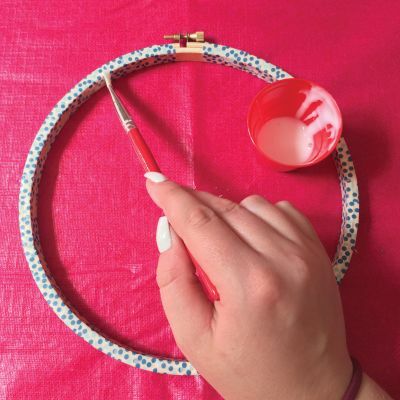 Begin by cutting pieces of washi tape approximately 1.5 inches long. 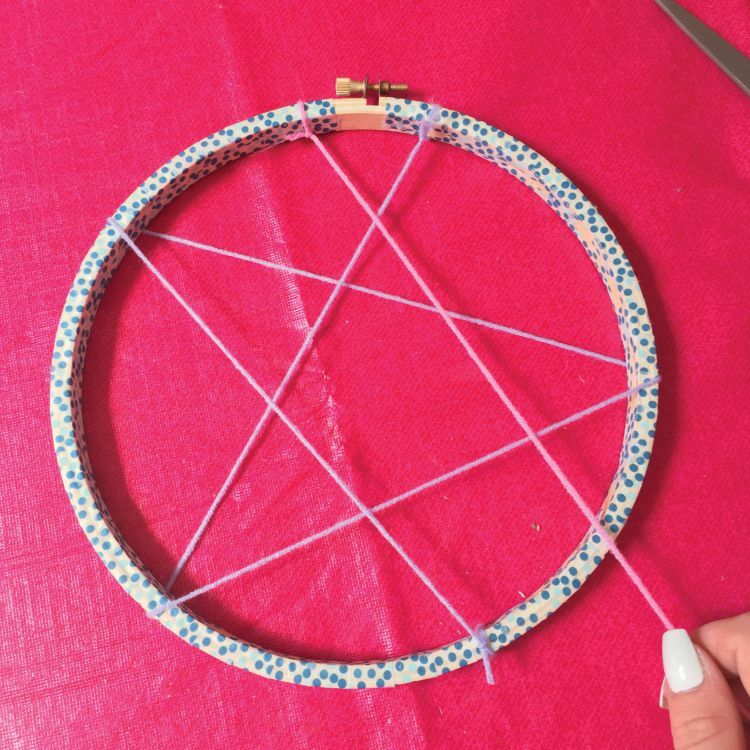 Wrap the pieces around your embroidery hoop, until covered. 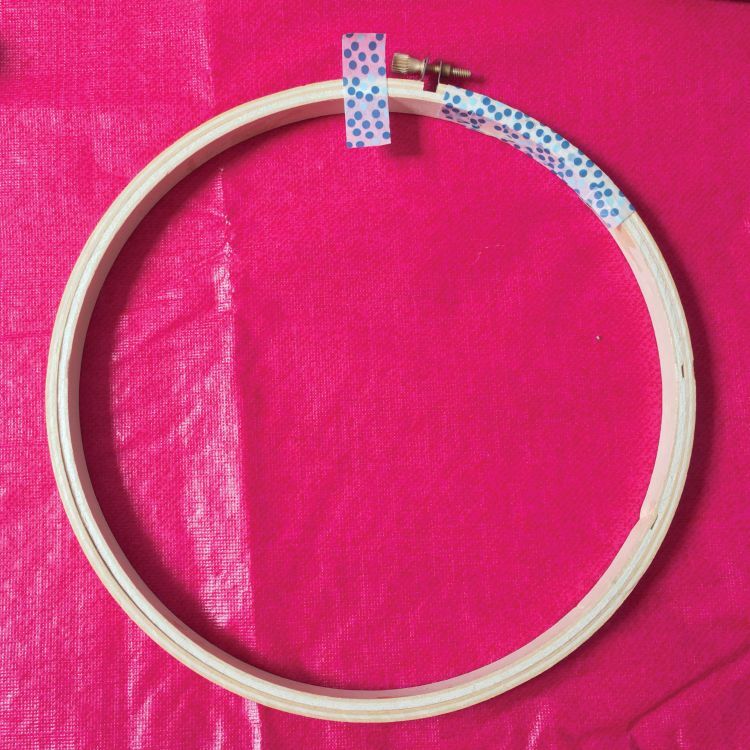 Glue the washi tape down to secure it onto the hoop. This step could be skipped, but I found it sticks much better with some glue. Take your first colour of yarn and cut a piece approximately 5 feet long. (The length is completely up to you. 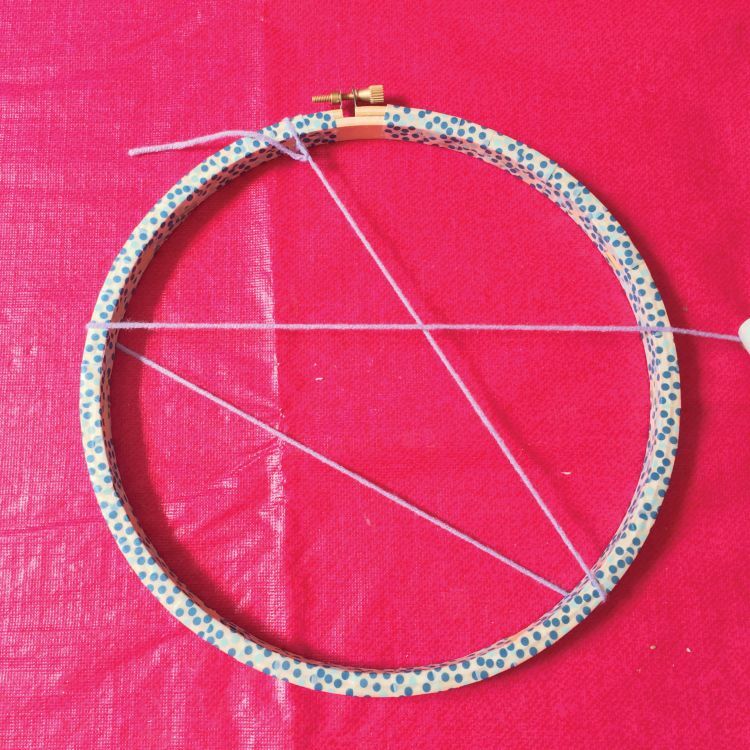 The longer the piece, the more wraps you’ll have on your hoop.) Tie it on and wrap around, until you only have enough yarn left to tie the other end. Cut any excess pieces. Take the second colour of yarn and cut to the desired size. I cut my second slightly longer than the first. Tie in a different spot and repeat the previous step. Cut four pieces of yarn (I used a third colour for this part) about two feet long and pick out your beads. 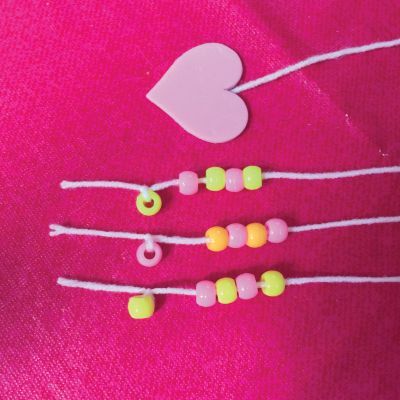 Add five beads to the first string and tie a knot at the bottom with the last bead. I continued this with two more pieces of yarn. For the last piece of yarn, I stuck on a heart foam sticker to add a little something else. 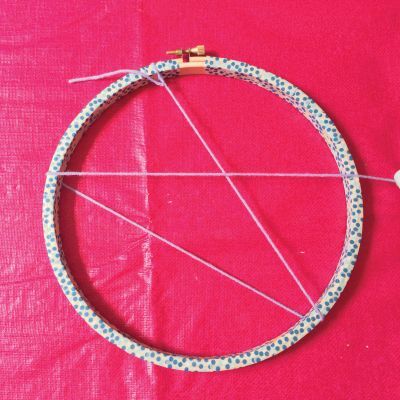 Now it’s time to tie on your yarn pieces to the hoop. Tie the first one slightly to the left. REPEAT with your next three pieces of yarn, and cut off any access. (All four pieces should be a different length.) 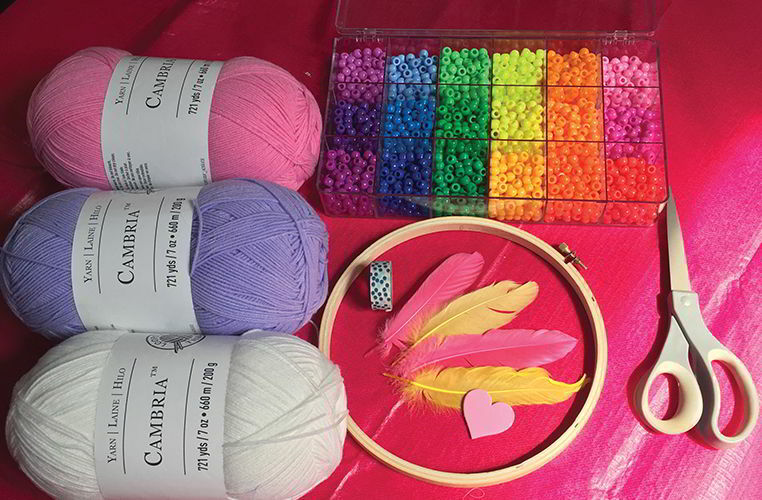 Once you’ve finished, all that’s left to do is stick a few feathers into the beads! I find the ones with a long stem work best, and there’s no gluing required. Time to hang it on the wall or window. 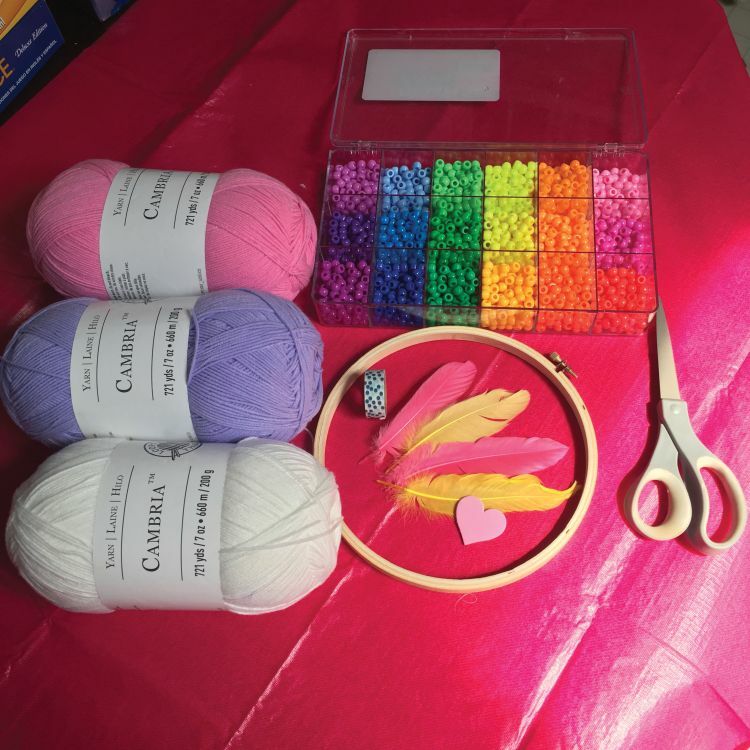 Former Calgary-resident Ashley Catton is a local DIY blogger who is frequently testing out child-friendly science experiments, crafting ideas and activities with her five-year-old step-daughter Nova. Living in the city for two years with her partner Curtis, she hosts DIY workshops throughout the community. To learn more, visit adventuresofastepmom.ca and follow her events on her ‘Adventures of a Stepmom’ Facebook page. Ashley Catton is a Fort McMurray DIY blogger who shares her crafting advice to the community through a variety of family fun activities. After living in Calgary for many years, she made the move up north to live with her boyfriend and step-daughter. 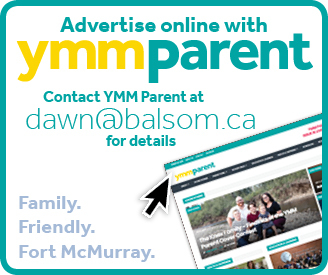 In every issue of YMM Parent, you will find Craftin’ with Catton, which is a spin-off from her blog – Adventures of a Stepmom. 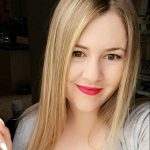 She hosts DIY events in Fort McMurray on a regular basis, so be sure to check out her social media platforms for announcements and event dates.